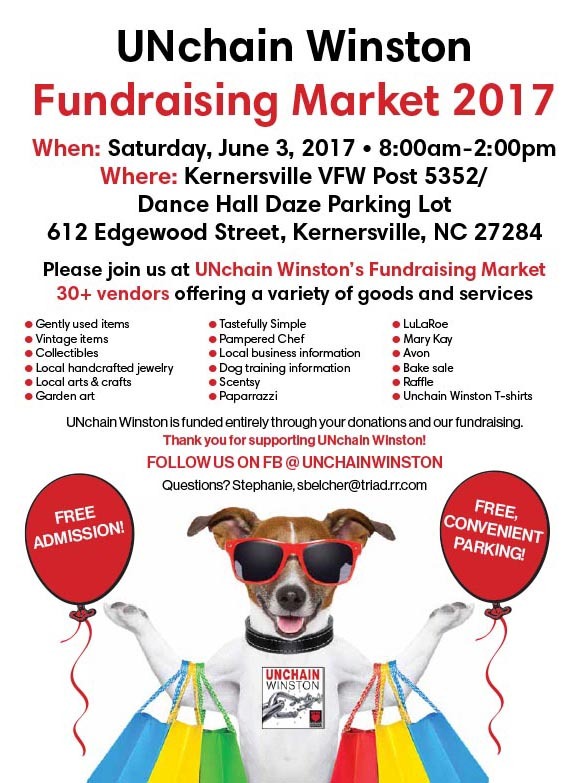 Our favorite non-profit, UNchain Winston is holding their 3rd annual fundraising market. 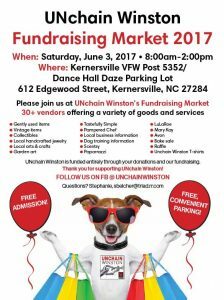 This Saturday, June 3 in Kernersville, NC. Over 30 great vendors selling a variety of goods. Come out, shop and support a great cause! 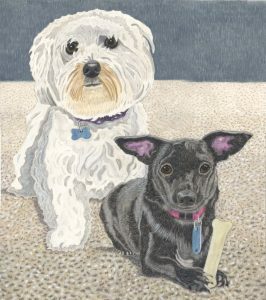 Last year, we got the best surprise—an out-of-the-blue letter from our sweet boys Jimmy and Joey, both adorable white terrier mixes we lost several years ago (Jimmy in 2003; Joey in 2015). They’d reconnected on the other side of the Rainbow Bridge and wanted to tell us all about the adventures they’re having together. 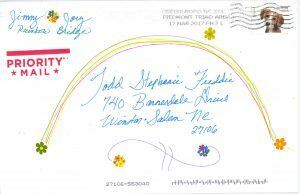 They promised to write often, but we know how kids can be and weren’t too surprised to not receive another note. Then, finally, look what arrived! 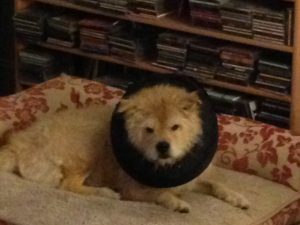 We hope you’ll take a few minutes to read what they have to say and those of you who are also missing precious pets that it gives you the comfort it gives us. We better start with apologies. In our last letter, we promised to write often, but we stay very busy! We hear that children at summer camp and college kids have the same trouble: They love and miss their packs back home, but aren’t diligent about taking a few minutes to reach out. In our defense, it’s even harder for us because we don’t have computers to Skype or smartphones to text. We hear some of the parrots and cockatiels tweet but for some reason they won’t teach us. What’s been keeping us so busy? Well, for starters we’ve welcomed several cat and dog friends, including Phyllis, Ray, Merlin, Kendra, OC, Faye, Skittles, and Tenchi. We know how much their people hated saying goodbye but you can let them know we’re taking good care of them and they’re all doing great. Then a group of shepherds and collies arrives to sort everyone out. 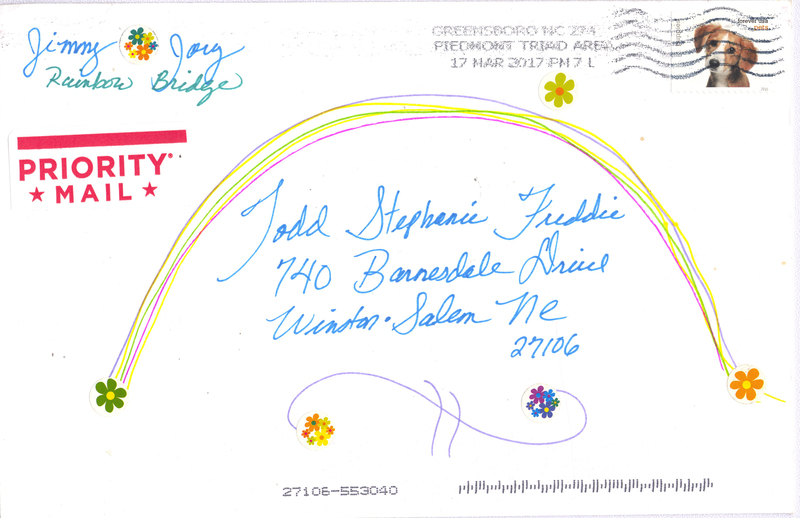 Newcomers with pack members who already live on this side of the Rainbow Bridge are matched with them. That’s how Joey and I got connected. Our friend Zoey the border collie happened to be working the day Joey arrived and she brought him right to me the moment she learned he was a Belcher. What a day that was! We had so much fun talking about all the wonderful times we had with you—the walks, car rides and vacations, but also the quiet times snoozing in the house, knowing we were safe and loved by the best people in the world. If a newcomer doesn’t have any pack members already here, the Pack Placement Committee—usually poodles and a few Abyssinian cats—spends a little time getting to know them, figuring out their daily habits and hobbies, and learning about their previous pack before placing them with the right group here. On the night Joey arrived—after I showed him all the cool places here, treated him to a big dinner and settled him into our little house—I turned on the TV. Everyone around here tunes in for the Puppy Bowl, Westminster dog show and Animal Kingdom reruns, and I knew Joey liked watching Braves games with Todd, but I had something extra special for him. I turned to channel 740 and there you were on the screen! It’s 24-hour access to everything you and Freddie are doing. I have to tell you: It really helped Joey when he got here. At first, he kept the TV on all the time, listening to you tell stories about him, remembering all his antics and quirks. Of course, it’s still our favorite channel. The Belchers are must-see TV, and we tune in every morning to watch Todd and Freddie take their walk, in the afternoon to see how Todd’s latest custom portrait is coming along and then again at dinner time to hear about your day. It’s probably not surprising but our favorite episodes are the ones where you reminisce, talking and laughing about all the good times we shared. We’ve told some of our friends about channel 740. 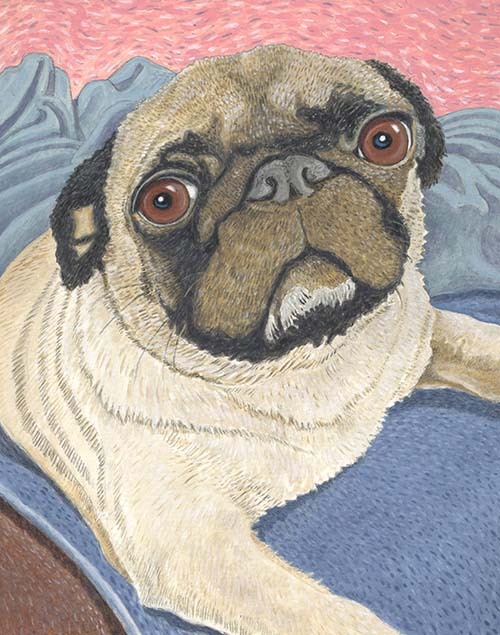 Of course, they have their own special channels to watch, but many of our pals have been subjects of memorial pet portraits and they love to watch Todd work and see how he creates those beautiful, cherished pieces of art. I’m not sure if I should even say this, but some pals who’ve had their likenesses painted by Todd get a little, let’s say, big-headed about the whole thing, telling everyone how their people loved them so much they had their portrait painted, framed and then hung on the wall where everyone who comes into the home can see it. If you watch their special channels with them, they are forever saying stuff like, “See my portrait in the den. I really think Todd captured my spirit. And my coat looks so glossy! How does he create those highlights?” I don’t like to remind them how many portraits of me and Joey (and Freddie) there are in our house. It’s never nice to brag about being a muse. Speaking of TV, it’s a rainy day here and Joey thinks we should binge-watch Scooby-Do and Clifford the Big Red Dog. Gotta go! 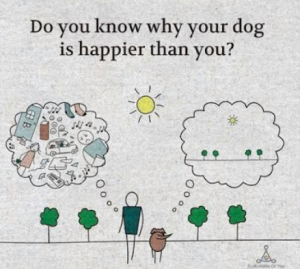 Dogs teach us so much everyday and this lesson is particularly true. We all need to slow down, enjoy the scenery and live in the moment. 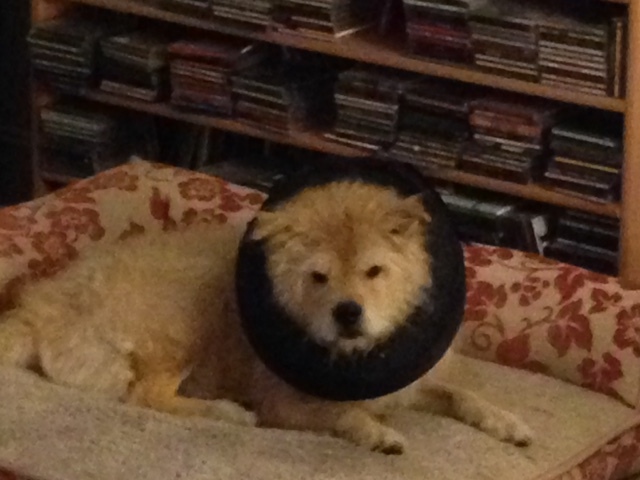 Chief Canine Officer Freddie, channeling her inner lion cub is rocking her new doughnut cone. Thankfully nothing serious, just a hot spot on her tail. Happy Anniversary to our friend Fran Alexander-Marshall and her partner. Thank you so much for trusting Todd to paint your precious pups, Chloe and Teddy for a special anniversary gift.